In a year of extraordinary exploits by so many swimmers, it was frankly impossible to select the absolute best performance of the year. Both teams and soloists swam between islands and between nations, across channels and across lakes. Every month, people were making the impossible seem possible in the world's open body of waters. But in the year where ice swimming and cold water swimming emerged as the sport's hottest topics, the tandem swim between the Diomede Islands by 38-year-old Alexandr Brylin and 45-year-old Grigori Prokopchuk was voted by the public as the 2014 World Open Water Swimming Performance of the Year. 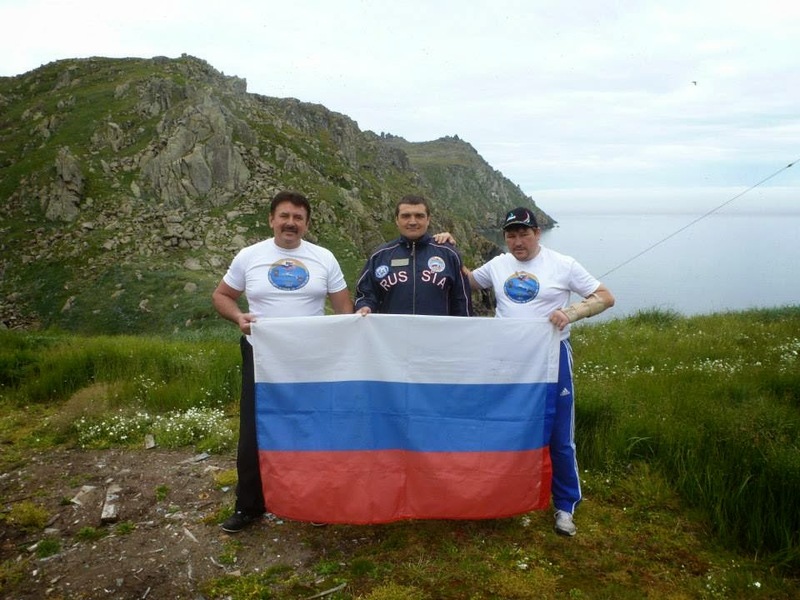 The Russian pair's swim from Little Diomede in the U.S.A. to Big Diomede (or Ratmanova Island) in Russia was a tough swim. As part of the program 'Arctic: The Present and The Future', the two Russian ice swimmers swam across the international dateline between the Pacific and Arctic Oceans as Lynne Cox first pioneered in 1987. Due to current drift, the ultimate straight-line distance of the swim was 5,600 meters as Prokopchuk finished in 1 hour 57 minutes and Brylin finished in 2 hours 7 minutes - doing breaststroke with a broken hand. "The water temperature fluctuated from between 3°C and 6°C," described Prokopchuk. "The sea was calm with low waves rippling on the surface. The swim started at 4:40 pm (Chukotka time) in the Pacific Ocean about 1,200 meters to the south of the Inalik village on Little Diomede. "We did not know any details about Lynne Cox's first swim between these two island on August 9th 1987," said Brylin. "So we had to plan this swim by ourselves with what we knew." But the duo previously participated in the 2013 Bering Strait Swim so that had a good idea what to expect in 2014. Viktor Godlevskiy [shown above] served as Brylin and Prokopchuk’s lifeguard and coach. Godlevskiy also participated in the Bering Strait Swim so his experience was much valued. Upon their arrival on American soil on Little Diomede Island, the trio started to get ready for the swim amid the thick fog, strong winds, heavy rain, and storm the day before the swim. "We started to prepare by examining the speed and the direction of the currents," said Brylin [shown below], broken hand and all. "[But] the fog came in so fast, it came like a sheet, so solid." The next day at 6:30 pm, their adventure began with a 2-hour boat trip to the starting point. "When the boat was 70 meters from the shore, Grigori and I dove into the water and swam to the coast so that they could start from the land. 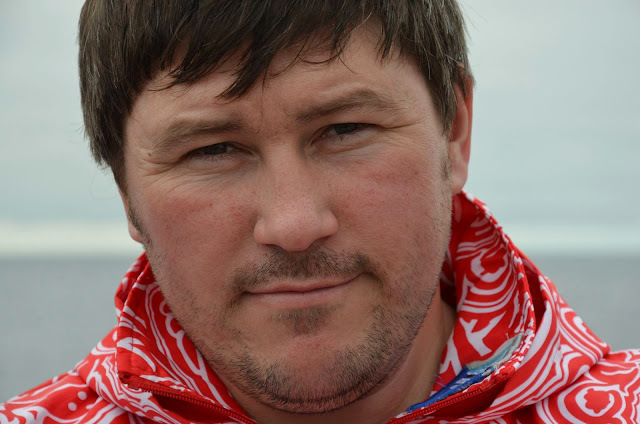 The water temperature was 6°C when Viktor Godlevskiy gave us the command to start from the rocky American coast." During the first half of the swim, the swimmers kept a good pace and swam near each other in a tandem swim. They had to overcome a strong current in the middle of the strait as well as a whirlpool. "We succeeded in doing so thanks to Viktor’s very competent instructions. He was constantly guiding us and telling how much was left to Ratmanova Island. Gradually it started to get dark on the border of Russia and the USA as the water temperature fell from 6°C to 3°C. A strong south current threw us about 100 meter apart from each other as Grigori swam freestyle and I swam breaststroke. We managed to get closer to each other, but the current became stronger and we had to swim 500 meters more to the north of the planned finish. Grigori managed to land on a small rocky beach, but I was drifted 150 meter farther." After touching the shore of the Ratmanova Island, the men were exhausted. The boat did not come immediately to pick them up so they built a fire on shore to begin the re-warming process. It was 2 hours before they left the island. "After everything, it took about 6 hours to get from the Little Diomede to the Ratmanova Island taking into account the time of both swimming and waiting." It was not easy to get to either the start or finish. They had to connect a lot of dots to pull off this swim. "Our itinerary from July 26th to August 8th started when we met in Petropavlovsk-Kamchatski. Grigori arrived from Yakutsk, I arrive from Blagoveshchensk, and we met Victor in Petropavlovsk-Kamchatski. Then we all flew to Anchorage, Alaska in the United States, and then to Nome and Wales (in Alaska). After a two-hour trip on a cruise ship Silver Discovery, we landed on Little Diomede before swimming from Little Diomede to Ratmanova Island. Later, a helicopter took us to Lavrentiya Village on the Russian mainland. From there, we took was a postal plane to Anadyr (Russia) and another flight from Anadyr to Khabarovsk and then onto Blagoveshchensk for me or to Yakutsk for Grigori, and to Petropavlovsk-Kamchatski for Viktor." Ultimately, the team made it and were subjects of a documentary film Arctic: The Present and The Future.